Renovo has been busting hump since its big debut in Pebble Beach, with the team behind the all-electric Shelby Coupe forming a partnership with Brembo, gearing up for production, and now showing off a high-tech interior to match its electric drivetrain. Oh, and it's quicker now, too. Before the Renovo crew headed down to Vegas we caught up with Christopher Heiser, the automaker's CEO, and he told us that they've managed to optimize the drivetrain in the past few months – well beyond what they were expecting. "We're significantly better on performance than what we quoted at Pebble," says Heiser, although after prodding him with a stick he still wouldn't cough up numbers. 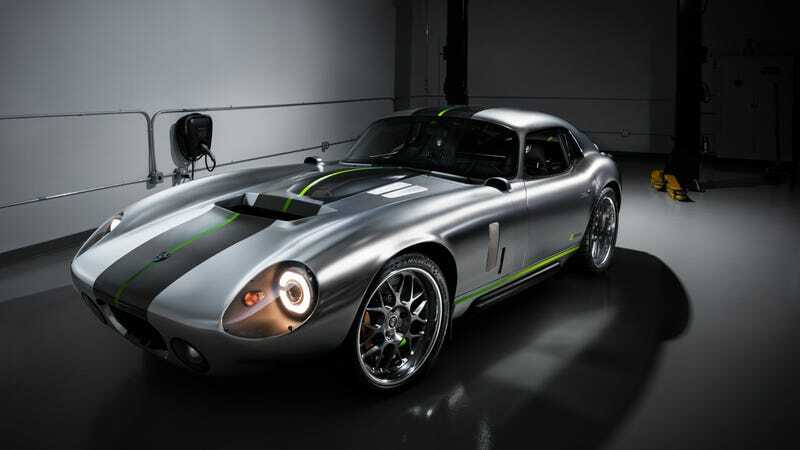 When the Coupe debuted, Renovo claimed the electrified Shelby Daytona CSX9000 was putting out 500 HP and 1,000 lb-ft of torque, with a 0-60 MPH run of 3.4 seconds. But "performance" could mean a lot of different things, from efficiency to acceleration, and the 3,250-pound EV is still only packing 30 kWh of batteries, so anything kind of improvements are welcome. Heiser and his partner, Jason Stinson, have also worked out a development deal with Brembo for a set of prototype carbon ceramic brakes. They're optimized for EV operation and should make the Coupe more efficient, boost range, and work better with the regen system. But the big news is its partnership with the chip nerds at NVIDIA, which debuted its Tegra X1 processor at CES this week. The Coupe has almost 1,000 sensors running on five integrated CANs, and to harness that much information Renovo reached out to NVIDIA to see what it was cooking up in its lab. The result is the first car powered by the X1 chip, processing data and displaying it on both the instrument cluster and new the 11.6-inch touchscreen on the center stack. "There's a lot of functionality in our car that we want to surface," says Heiser. But displaying all that information and allowing owners to customize it to suit their needs has been difficult. The new chipset and the rendering engine behind it solves those problems, providing enough horsepower to not only crunch the data, but using NVIDIA's real-time rendering software to make changes on the fly. All-in, it only took Renovo and NVIDIA a few weeks to get the system up to snuff for its debut in Vegas, and despite calling it a "concept", this is pretty close to what Renovo is planning for the production model. Heiser says they're still set to begin production this year and they'll be taking deliveries of a few more chassis to develop both road models and track models for testing. "We want to put enough track miles on the car that the experience will just blow people away," says Heiser. "That's all we want to do: blow them away."